Day Visit to Kapunda Plants, Hellebore Specialist Bath – 31st March 2017. There are two spare places for this visit, due to a cancellation. Church Crookham Garden Society is organising a visit to Kapunda Plants, just south of Bath. The visit is planned for Friday 31st March, 2017 arriving before 11:00h. The visit lasts about 1 and a half hours, refreshments are provided on arrival. 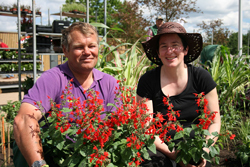 The tour will visit the display beds and propagation greenhouse. A talk will be given on the development of the 0.8ha garden and propagation techniques with questions and answers along the way. Cost £8.00 Visitors to arrange transport including sharing opportunities. Journey time via A303 about 2 hours. A light lunch is planned before returning. If you are interested, please email asap the CCGSoc chairman, Alec Grant chairman.ccgs@outlook.com who will be pleased to answer any questions you may have. Once the number of participants has been determined, detailed arrangements will be published. Spring Show – 1st April 2017 staging at 08:30 to 10:30h. Viewing 12:30 with prizes at 13:30h. Summer Show – 16th September 2017 staging 08:30 to 10:30h. Viewing 15:00 to 16:00h. Harvest Supper and Quiz – 7th October 2017 19:30 to 22:30h.